Patricia Tsai’s modern chocolate empire expands. Lots of women love chocolate, but no one loves it as much as Patricia Tsai, who has turned her passion for the conviviality around the sweet treat into a hands-on business. When Tsai started her company, Chocovivo, in 2005, she was driving through Mexico with a pallet of raw cocoa nibs from a farm in Tabasco, Mexico. “It was crazy, but I knew it was what I wanted to do,” she says, remembering the early days. After years of selling at farmers’ markets around town and recently out of a tiny storefront in Venice, Tsai will finally open a public production and retail space for Chocovivo on Monday, July 15. Up above, a peek inside the new space, just off Washington Boulevard and Centinela. Tsai sources her cacao beans exclusively from a grower in Comalcalco, a city in Tabasco, Mexico. About a ton of beans arrive each year, just for Chocovivo. Tsai stores them (chilled) until it’s time to grind. She roasts them to varying degrees of caramelization, and then hand grinds them with sugar, vanilla, cinnamon, or any number of natural flavors like coffee, toffee, and even dried berries and lavender. Each bar must go through the grinder a minimum of five times. The first few times, the cacao turns into grit, and then powder. Eventually, aided by the warmth of the machine, cocoa butter seeps out of the beans and homogenizes with the powered cocoa to form liquid chocolate. After it’s ground, Tsai then tempers the chocolate, a process by which the crystals in the mixture are aligned—it’s what gives properly stored chocolate that appetizing sheen. The results are chocolates with a true snap and velvety texture. 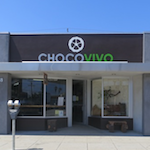 At the new Culver City outpost, Chocovivo will offer the same selection of retail goods that were on offer at the Venice shop (powered hot cocoa mixes, chocolate bars, and chocolate snacks) in addition to hot cocoa—both chocolate water, brewed like coffee as well as thick chocolate shots, Aztec-style. Pain au chocolat, and a small selection of pastries, including a fruit and chocolate toast will also be available daily. Eventually, Tsai plans to offer classes and tastings at the new shop. It’s the only place in L.A. to learn how chocolate is made, from bean to bar.